We’ll be having a casual discussion in Second Life tomorrow at 1PM, and anyone is welcome to attend. The topic will be ways to improve the SL user interface and usability. Lex Neva has kindly let us use her new plot of land in Hippotropolis for the chat. Thanks, Lex! Topic: User interface, usability, accessibility, etc. It should be a fun chat, kicking back and talking about how we can make SL better. I hope some of you will drop in! I’ve made a post about this already over at the Imprudence blog, but I wanted to post a reminder that I will be overthrowing Resident Experience office hours tomorrow to force my hateful rhetoric down your throats. The topic will be Imprudence, my latest jihad against common sense and the will of the masses. My henchman and I will be available to answer questions and talk about my master plans to remove everything useful from SL and impose my own brand of horribly crippled (yet oh-so-pretty) software upon you all. Whom I despise. Where: Benjamin Linden’s office in Second Life. It should be fun; I hope to see you there! I’ve been plotting and scheming and laboring for the past month on a new project. Those of you who have heard me hinting darkly of a grand manifesto and giggling maniacally in the dead of the night — now you’ll find out why. 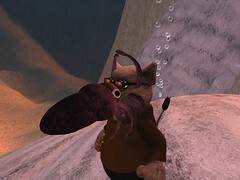 Imprudence is (or rather, will be) a major fork of the open source Second Life Viewer. Our aim is to greatly improve the usability of the Viewer through community involvement, thoughtful design, modern development methods, and a pro-change atmosphere. Why are we doing this? Because we, the Second Life Residents, need a better Viewer, and Linden Lab isn’t getting it done — not fast enough, anyway. I’m sure they’re trying. They have made some modest improvement. But they are faced with intractable obstacles that block them from making real progress: a lack of resources, an overloaded QA process, and a large established user base who are, on the whole, sullenly content with the way things are — and tend to resist any change. Those are tough problems, and I don’t foresee Linden Lab being able to get past them any time soon. Rather than continue to push against these obstacles with little to show for it, I’ve decided to carve another path. A community project has its own obstacles, but they are obstacles that we can overcome. They are obstacles we can act against for ourselves, instead of sitting on our hands waiting for someone else to act for us. Go on and read the full post and our manifesto. I have high hopes for this project. It has been a long time coming, and there are a lot of people dissatisfied with the current viewer. If you’re one of them, get involved in the project and help us make it better! I had the opportunity to attend a presentation today by Louise Later, who demonstrated two scripted objects, still in development, designed to help people with limited or no vision enjoy Second Life. Given that many sighted people find Second Life challenging to use, one can only imagine the unique difficulties of using it without visual feedback! The objects — your choice of mobility cane or guide dog — use repurposed sensor and warp scripts to let users navigate and learn about their Second Life surroundings without any visual feedback. The sensor script can scan the surroundings for objects and avatars and output their names into your chat history, where EVA (an SL-specific screen reader) will then read them aloud to you, allowing you to hear a list of everything around you. The warp script can move you to an object or person, or move you through a series of locations (e.g. orientation displays). It can also continuously follow another avatar, perfect for getting a tour of the world from a sighted friend! Louise told us that a core team of seven programmers, many of them blind* themselves, have developed the scripts, supported by Virtual Ability. They’re looking for additional help (especially more scripters) so if you’re interested in volunteering a bit of your time to a worthwhile and rather interesting cause, send an IM to Louise Later in SL! * Update 2008-09-07: Louise informs me that only one programmer is totally blind, while she herself is legally blind. But, almost everyone in the group is disabled in some way. The cane and guide dog objects are available for free at Wheelies. Virtual Ability runs Virtual Ability island, a beautiful tropical island sim with a thorough SL orientation tutorial (with both written signs and audio information! ), and the famous Heron Sanctuary. My blog now has a new home at Tentacolor.com! After bumming off my friend for two years (thanks, Mera! ), it’s about damn time I got my own domain. I set aside some time the past few days and performed the migration — and it was a complete success! If you’re reading this in an RSS reader (I can hardly blame you), you should stop by the site to check out the theme. It’s based on the theme “Cloudy” by aoemedia, but I’ve brought it down below sea level (and therefore affectionately refer to it as “Murky”). People I’ve shown it to seem to get a kick out of the header, especially. You may be wondering what the heck “tentacolor” means. I know I would, if I didn’t already know! As I explained in a blog post almost exactly one year ago, it’s a play on the Italian word for tentacle, tentacolo. As you can see, I’m embracing my cephalopodic reputation with all 8-to-12 wriggling, slimy, cuddly tentacles! This Saturday, August 9, I’m putting Squidogram on the shelves again — forever! In case you missed it, Squidograms are an amusing gag-gift-slash-greeting-card that I sold this past Valentine’s Day. They’re sort of like a Candygram®, except instead of a box of candy, the recipient gets a talking squid sucking their face! I will hold a brief ribbon-cutting event Saturday at noon SLT at the new Cuddlefish Junction location in Dynamism, and then place the Squidograms for sale. Unlike the V-day squids, these will be available year-round—a squid for all occasions! Each Squidogram is just L$50, and will be available in 5-packs and 10-packs at a discount. 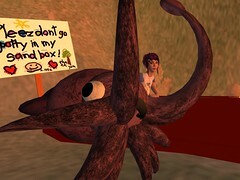 And, to celebrate the return of Squidograms and the official reopening of Cuddlefish Junction, all items (including the Squidograms and the ever-enjoyable Bubble Ride) will be half-off regular price from noon Saturday until midnight!